As Justin Gatlin prepares for his 100-meter-dash heat in the merciless process of elimination known as the U.S. Olympic track and field trials, news of Usain Bolt’s hamstring injury sends a tremor through the University of Oregon’s Hayward Field on this July afternoon. Bolt, the greatest sprinter ever, the only person to win the 100-, 200- and 4-x-100-meter relay in consecutive Olympics, is seeking another three golds in Rio — an unfathomable triple-triple. When healthy, the Jamaican is unbeatable. When ill-prepared, however, Bolt is ever-so-slightly vulnerable. Gatlin has spent the past six years pursuing the legend. Longer if you count his four-year suspension for using performance-enhancing drugs. Living in speed’s shadow, trying not to think about Wile E. Coyote chasing the Road Runner, can turn doubt into fact. At last year’s world championships in Beijing, Gatlin inexplicably botched his best chance to defeat an out-of-shape Bolt, losing by an excruciating .01 of a second. Rio had been expected to crown Bolt’s transcendent career. Holding three fresh gold medals on the last day of the games on Aug. 21 — his 30th birthday — Bolt would stand as the track version of Michael Jordan or Muhammad Ali. Then came the left hamstring tear and Bolt’s withdrawal from his country’s Olympic trials. Although he’d later earn passage to Rio by competing in a London race, the injury has turned these Olympics from an inevitable coronation into an actual competition — as if the starting gun had sounded six weeks before the 100-meter final. On Aug. 14, in the final of the Rio 100-meter dash, Gatlin’s quest for redemption will challenge Bolt’s immortality. One man will cross the finish line before the other, and only one dream will come true. Start, drive phase, maximum velocity, finish: Coaches break down every 100-meter race into distinct stages. No one starts the 100 faster than Gatlin. Crouched for the starting gun on July 2 in that first heat of the U.S. trials, Gatlin lets his hands tremble to activate his fast-twitch muscle fibers. His powerful 6-foot-1, 180-pound body bursts from the starting blocks with his torso low and parallel to the ground, feet flashing forward just inches above the track. Gatlin scorches a 9.80 to win the trials’ 100 final, the fastest time this year. Bolt’s best time this year — before he tweeted a picture of electrical stimulation wires attached to the back of his left thigh — is 9.88. Justin Gatlin crosses the finish first with a time of 9.80 in the men’s 100-meter final during day three of the U.S. Track & Field Olympic trials at Hayward Field in Eugene, Oregon. By now, however, the world knows that Bolt wins from behind. In recent seasons, he has been sluggish in early races, then surged to victory in the world championships. Even with a tender hamstring, Bolt is favored to seize the triple-triple in Rio — and to record another three wins against Gatlin, who also qualified for the 200-meter and should compete for the United States in the men’s relay. After blasting out of the starting blocks in his trials heat, Gatlin enters his drive phase with the precision of a painstakingly crafted machine. His body rises to a 45-degree angle while his head faces down toward the track. As his arms and legs cycle furiously, his torso, shoulders and head remain almost still, with no wasted sideways motion impeding his acceleration. His chiseled mahogany muscles are decorated with at least 13 tattoos, including the word “God-speed,” a four-leaf clover and a roaring tiger, “because I’m an animal when I get on the track.” He even speaks rapidly, clipping off the ends of words to move on to the next thought. By contrast, Bolt, who has a history of back problems, seems to lumber into his drive phase with the effort of propelling his enormous body forward. His shoulders seesaw up and down and his head moves side to side as he gathers his limbs into alignment. Asked about Bolt’s latest injury, Gatlin notes the difference between track and field rules in the United States, where the only path to the Olympics is to finish in the top three at the trials, and in Jamaica, where exceptions are made for royalty like Bolt. Jamaica’s Usain Bolt (R) and Justin Gatlin of the United States compete during the men’s 4-x-100 meter relay final at the 2013 IAAF World Championships at the Luzhniki stadium in Moscow on Aug. 18, 2013. Gatlin is 34, ancient for a sprinter, but he runs faster than he did as a young man. That feeds speculation around the doped-up sport of track and field that Gatlin is still doping, or at least still benefiting from the dope he was punished for taking 10 years ago. Gatlin was once the world’s fastest man, the heir to the American kingdom of global sprint dominance. In the 2004 Olympics, Gatlin, then 22, captured the 100-meter gold in 9.85 seconds. He won the 2005 world championships in 9.88 seconds and the 200 in 20.04. In May 2006, at the IAAF Super Grand Prix in Doha, Qatar, Gatlin equaled the world record of 9.77 seconds. Finishing the drive phase of his career, he had accelerated to the front of his sport. Others were close, including Jamaica’s Asafa Powell and fellow American Tyson Gay. 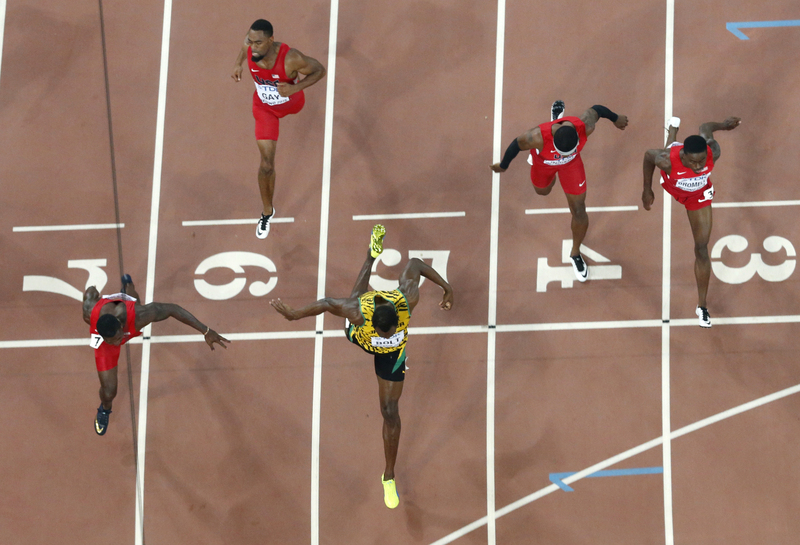 But Gatlin was where every sprinter wants to be at the halfway point — in front. At the time, Gatlin was coached by Trevor Graham, now banned from track and field for life. Graham sparked the BALCO scandal, which entangled baseball star Barry Bonds, by sending a steroid-filled syringe to anti-doping authorities. He coached Marion Jones to drug-fueled golds in the 2000 Sydney Olympics, and other world-class athletes testified that Graham gave them various banned substances. Less than three months after equaling the world record, Gatlin revealed he’d tested positive for testosterone. His record-tying time was wiped off the books. When he was at the University of Tennessee, Gatlin had served an arguably unfair one-year ban for an amphetamine violation, which came from medication prescribed for his decade-old attention deficit disorder treatment. The 2006 testosterone offense could have brought a lifetime ban. But due to the mitigating circumstances of his first violation and his cooperation with authorities in the second, Gatlin received an eight-year sentence from track’s governing body, the International Association of Athletics Federations. He appealed to an arbitration panel, which reduced the penalty to four years. Justin Gatlin of USA celebrates after he won gold in the men’s 100 meter final at the 10th IAAF World Athletics Championships on Aug. 7, 2005, in Helsinki, Finland. Is Gatlin now clean? Is Bolt? Who knows? Track and field is cursed by this uncertainty. Bolt has never tested positive and is globally beloved. The sport needs him to be clean. Gatlin was caught taking performance-enhancing drugs and is still branded as a cheater. Gatlin sidesteps questions about his past drug use and can become testy when pushed on the subject. During his four-year sentence, Bolt overtook him. “I must imagine, when [Gatlin] goes to bed, it must really ache at him,” says Colin Jackson, a BBC commentator and former world record holder in the 110-meter hurdles. Gatlin and Bolt have faced each other in the 100 eight times. Gatlin has won only once, in the 2013 Golden Gala meet in Rome. Gatlin ran a 9.94; Bolt was coming off hamstring injuries and ran an uncharacteristic 9.95. Jackson says sprinters’ minds can slow them down more than a headwind: “As an athlete, you always want to have a clear mind, clear focus. On a mid-March afternoon in Kingston, Jamaica, a masseuse kneads Bolt’s million-dollar legs on a fold-out table in the gravel-and-dirt parking lot of the University of the West Indies practice track. 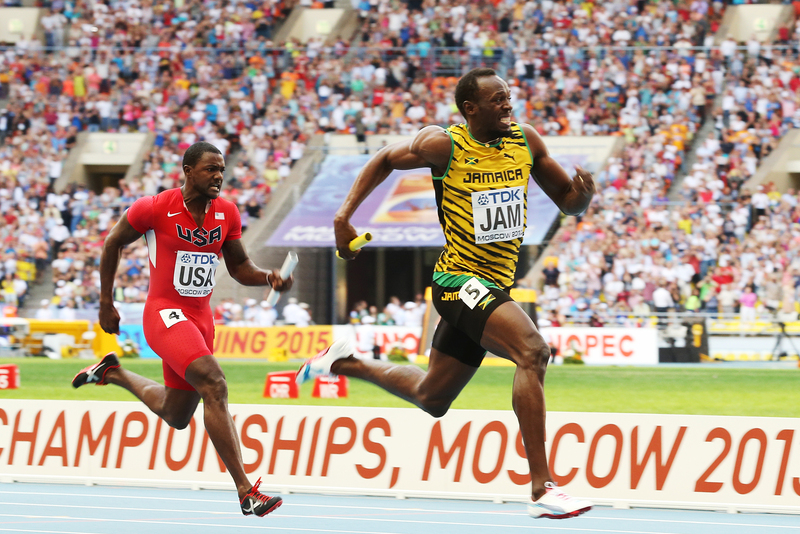 Soon Bolt begins a series of punishing 200-meter sprints. Up close, his power and force are palpable as he pounds down the backstretch. Bolt’s strides are longer than everyone else’s. He takes fewer steps to complete a race while moving his legs faster than a tall man should be able to. This equation produces an unmatchable maximum velocity. Jamaica’s Usain Bolt (L) and USA’s Justin Gatlin (R) celebrate after winning first and second place, respectively, in the final of the men’s 200 meter athletics event at the 2015 IAAF World Championships at the “Bird’s Nest” National Stadium in Beijing on Aug. 27, 2015. In the months before the 2008 Beijing Olympics, Bolt clocked a hair-raising 9.76. Several weeks later, he broke the world record with a 9.72. Next came the insane 9.69 in the Olympic final, when he began celebrating 10 yards from the finish line, and the 200-meter world record of 19.30. Beijing is where Bolt introduced the globe to his now-famous “To Di World” pose: legs wide, body leaning back, both index fingers pointing into a distance that seems but an instant away. In 2009, Bolt lowered the 100-meter world record to 9.58 and the 200-mark to 19.19. No one has come close to his records since. Compared with anyone but Bolt, Gatlin’s maximum velocity is superb. His back is straight, knees pumping high. “Up running strong, running tall,” he says. But he is four inches shorter than Bolt — the distance by which he lost the 2015 world championship. They are probably right, which elevates the challenge from mental to existential. 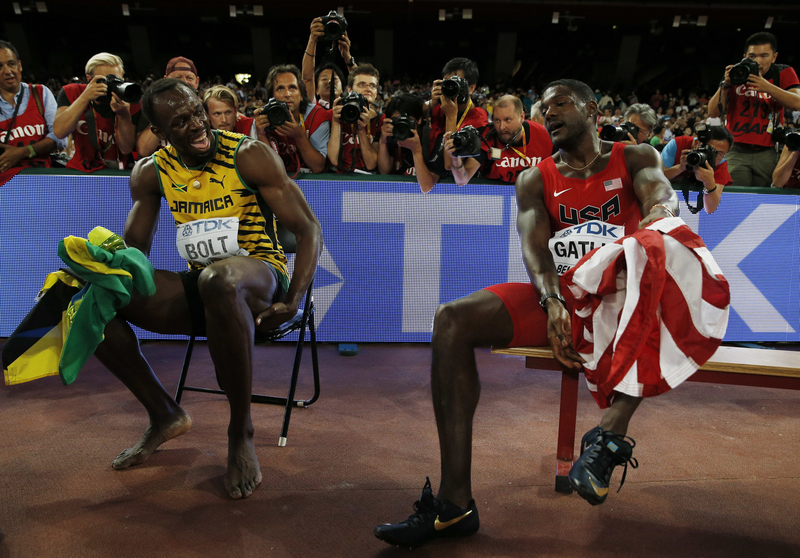 Last year, at the world championships, Gatlin briefly glimpsed an answer to the riddle — and then he blinked. In the 100-meter dash, athletes can run at maximum velocity only until about the 70-meter mark. After that, they must hold on to as much form and speed as possible, then lunge for the finish line. No one has ever finished the 100 like Bolt. And then Gatlin’s perfect form crumbled. His arms flailed. His strides became choppy. His torso’s die-cast solidity melted. Bolt edged him by one one-hundredth of a second, 9.79 seconds to Gatlin’s 9.80. 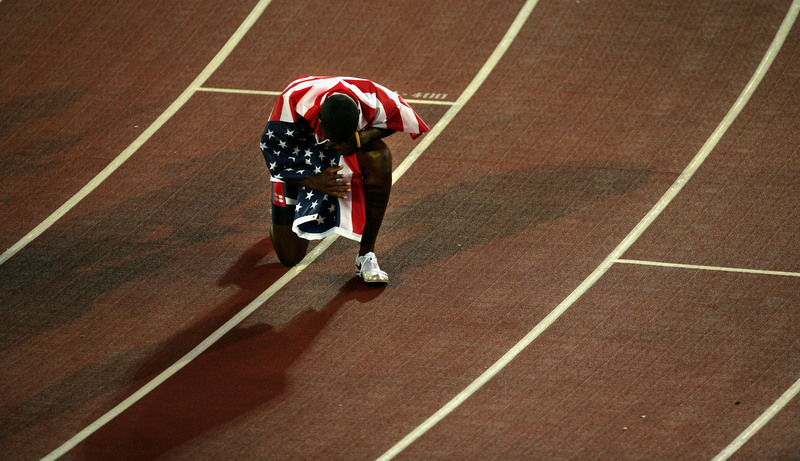 Later, in the bowels of the stadium, Gatlin reportedly broke down and cried. Jamaica’s Usain Bolt (C) crosses the finish line to win the gold medal in the men’s 100 meter ahead of Justin Gatlin of the United States at the World Athletics Championships at the Bird’s Nest stadium in Beijing on Aug. 23, 2015. Two weeks before Rio, Bolt pushes back. When Bolt withdrew from his Olympic trials, Jamaica’s opaque rules required him to “prove his fitness” before the games. This proof takes the form of a 200-meter race in London on July 22, some 20 days after his injury. Bolt wins with a respectable but less-than-intimidating time of 19.89 seconds. Afterward, he takes aim at Gatlin’s comments about Jamaica allowing athletes who aren’t ready at the country’s trials to compete in the Olympics. “For me, I felt it was a joke, I felt it was a disrespect they think I’d back out of a trials,” Bolt says, even though Gatlin said nothing about backing out. “I’ve proven myself year on year that I’m the greatest. I laughed when I heard it. I was disappointed, especially in Justin Gatlin. 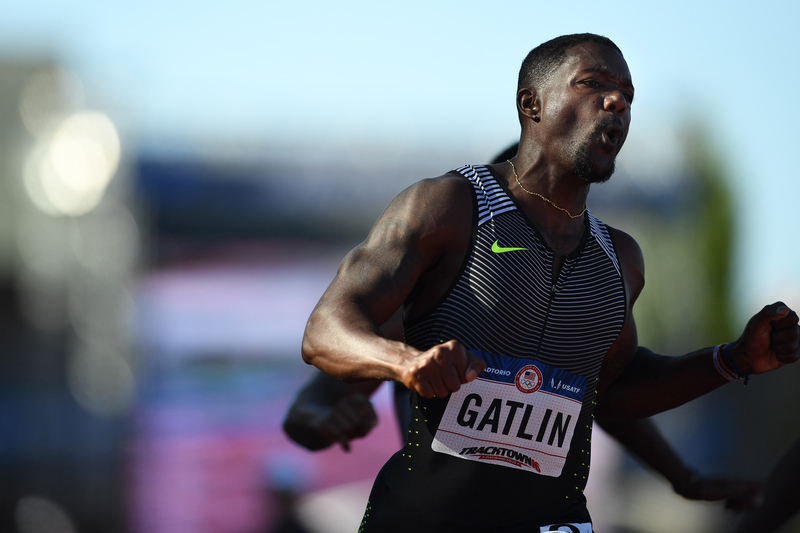 Gatlin declined an interview request after the U.S. trials, saying he wanted to focus on his training. Questions about his chase can only slow him down. Bolt’s unassailable records prove he’s the fastest ever, but greatness is more than numbers. A loss to Gatlin in Rio would mar his legacy. Unless Gatlin can clear his mind and outrun his past. CORRECTION: The original version of this story did not reflect that Drummond is contesting the allegation that he provided DHEA, which is not a steroid as previously stated, to Gay while coaching him. ESPN reporters Tom Hamilton and Martyn Thomas contributed to this story.